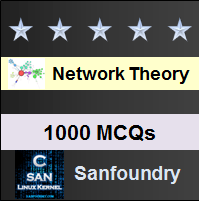 This set of Network Theory Multiple Choice Questions & Answers (MCQs) focuses on “Thevenin’s Theorem”. 1. Consider the circuit shown below. Find the equivalent Thevenin’s voltage between nodes A and B. Explanation: The thevenin’s voltage is equal to the open circuit voltage across the terminals AB that is across 12Ω resistor. Vth = 10×12/14 = 8.57V. 2. In the circuit shown above in question 1 find the thevenin’s resistance between terminals A and B. Explanation: The resistance into the open circuit terminals is equal to the thevenin’s resistance => Rth = (12×2)/14 = 1.71Ω. 3. 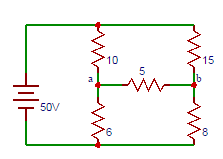 In the figure shown above in question 1 find the current flowing through 24Ω resistor. 4. Determine the equivalent thevenin’s voltage between terminals A and B in the circuit shown below. Explanation: Let us find the voltage drop across terminals A and B. 50-25=10I+5I => I=1.67A. Voltage drop across 10Ω resistor = 10×1.67=16.7V. So, Vth=VAB=50-V=50-16.7=33.3V. 5. Find the equivalent thevenin’s resistance between terminals A and B in the circuit shown above in question 4. Explanation: To find Rth, two voltage sources are removed and replaced with short circuit. The resistance at terminals AB then is the parallel combination of the 10Ω resistor and 5Ω resistor => Rth=(10×5)/15=3.33Ω. 6. Determine the equivalent thevenin’s voltage between terminals A and B in the circuit shown below. Explanation: Current through 3Ω resistor is 0A. The current through 6Ω resistor = (50-10)/(10+6)=2.5A. The voltage drop across 6Ω resistor = 25×6=15V. So the voltage across terminals A and B = 0+15+10 = 25V. 7. Find the equivalent thevenin’s resistance between terminals A and B in the circuit shown above in question 6. Explanation: To find Rth, two voltage sources are removed and replaced with short circuit => Rth=(10×6)/(10+6)+3=6.75Ω. 8. Determine the equivalent thevenin’s voltage between terminals ‘a’ and ‘b’ in the circuit shown below. Explanation: The voltage at terminal a is Va=(100×6)/16=37.5V, The voltage at terminal b is Vb=(100×8)/23=34.7V. So the voltage across the terminals ab is Vab=Va-Vb=37.5-34.7=2.7V. 9. Find the equivalent thevenin’s resistance between terminals A and B in the circuit shown above in question 8. Explanation: To find Rth, two voltage sources are removed and replaced with short circuit => Rab=(6×10)/(6+10)+(8×15)/(8+15)=8.96≅9V. 10. Find the current through 5Ω resistor in the circuit shown above in question 8.